The fact that LG was to display its exciting new 15-inch OLED TV at IFA this year was one of the worst kept secrets in tech. Currently the only OLED TV available is Sony's XEL 1 11-inch OLED TV which is both brilliant and hyper expensive. So how does the 15-inch LG OLED TV compare? It's fair to say that LG's OLED TV is jaw droppingly pretty. It's amazingly bright and rich with colour, and the contrast ratio looks miles better than any other 15-inch TV we have ever seen. Unfortunately, there were absolutely no details given at the stand - and even in the LG press conference this afternoon there was absolutely no mention of OLED technology at all. 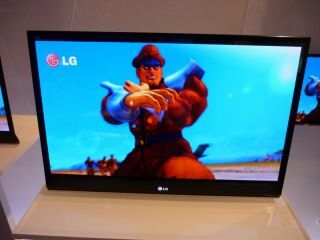 LG preferred to focus on its brand new LH9000 LED-backlit LCD TVs which have a stated contrast ratio of 3,000,000 to 1. We managed to corner LG engineer, Jeong Woo Choi, on the stand and he told us that the 15-inch OLED TV has a tentative release date of December 2009. We are very excited by this TV as it really is a fantastic bit of kit. It's impossibly thin as well – we didn't have a ruler and LG wouldn't tell us the exact thickness but it couldn't have been more than a two or three millimetres. And the most exciting thing of all is the fact that this 15-inch model is just a stepping stone to LG releasing a 32-inch model next year. As proof of tech then, the 15-inch OLED is brilliant. But it doesn't do much to dispel the problem that the Sony TV has – it's just too small to be worthwhile. The price, too, is likely to be even more extravagant than the Sony one. So unless you see one of these at a show or in a store you're unlikely to see one… ever. However, the 32-inch model may be another story and we wait for it with heightened anticipation.